The group met at the RSPB’s Leighton Moss reserve with the aim of providing a forum for the exchange of ideas and experiences, focussing on the role of grazing in hay meadow restoration. Leighton Moss is centred at the heart of the Arnside and Silverdale Area of Outstanding Beauty (AONB), one of England’s richest and most diverse conservation areas and noted for the beauty of its grasslands. Introductions, led by Ruth Dalton, Field Officer for the RBST, were followed by a talk from Bill Grayson, co-owner of the Morecambe Bay Conservation Grazing Company (MBCGC), who with his wife, Cath, has, over the past 20 years, developed a specialized cattle grazing system that is dedicated to delivering benefits for nature conservation across a range of sites throughout north west England from its base in this AONB. The ecological value of all these various sites has steadily increased under the sympathetic grazing management they receive by these means. Although this makes MBCGC quite a specialist farming business, it relies on much the same sources of income as any other upland livestock holding, most of which comes from the area payments that derive from the EU’s Common Agricultural Policy. It also benefits financially from being organically certified, which secures a 5-10% premium for the cattle sale price, whilst achieving significant savings in input costs. 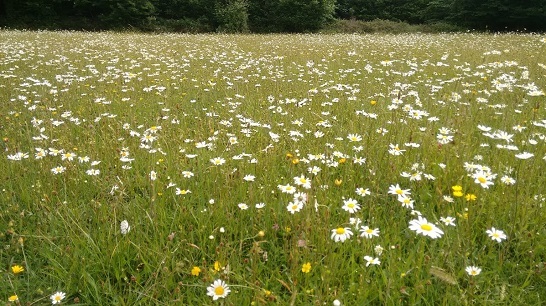 All the grazing land is rented, but the landlords are mostly conservation bodies like RSPB, Natural England, and the Wildlife Trusts, all of whom recognize the special benefits that this nature-friendly grazing service provides, showing their appreciation by only charging very modest rents for the land. It might seem inappropriate to look to a grazing operation for ideas about restoring traditional meadows, which are generally considered to rely on being mown each year for a hay crop. However, MBCGC has had years of experience of meadow management and is currently restoring about 60 acres of meadow in all. The crop that is taken from the holding’s better fields is used both as a winter feed for the cattle and also to provide a source of flower seed by which the species richness of fields at the start of the restoration process is enhanced. The process used is similar to green hay strewing but differs in that it relies on dried hay rather than fresh-cut grass. Its main advantage is the extra convenience with which it fits into the already busy work schedule of a livestock farm, where groups of cattle can be out-wintered and fed on the recipient sites. The animals eat most of the bulky material from where it is scattered in small heaps across the site, choosing different parts of the field each day to avoid excessive damage to the turf. This allows any seeds contained in the hay to fall out, whereupon they get trodden into the surface of the soil, ready to start germinating the following spring. Having listened to Bill’s account of the work of MBCGC, the group set out to visit Gait Barrows National Nature Reserve, where Bill and Cath’s cattle have been coming for the last 20 years to graze its 30 acres of pasture, pasture that has, over the last 10 years, become one of the richest sites in terms of its species composition anywhere in the Arnside & Silverdale AONB. On this occasion, the herd consisted of just 12 cows – a mixture of Red Polls, Shorthorns and Blue Greys - all running with a Red Poll bull. The cattle had arrived on the site just a few days previously so most of its floristic interest was still very much in evidence, with carpets of yellow rattle, northern marsh orchid, spotted orchid, ox-eye daisy, self heal, cats ear and rough hawkweed, all combining to make the kind of colourful floristic display that we all associate with a traditional hay meadow. Surprisingly, however, this is one species-rich meadow that is not mown for hay, or at least not any more. Instead, the crop is completely removed by the grazing activities of the cattle, which are brought on at the beginning of July each year and removed at the end of November. This system has proved to be very effective in allowing this attractive diversity of flowers, one by one, to establish and spread across the site, all of them following closely in the footsteps of the hay rattle, which acts as catalyst in the whole process. This had started as a fairly uninteresting expanse of species-poor grassland back in 1990 when the then-tenant decided to give up mowing it, having decided that the diminishing yields being achieved without fertilizers had made it unviable in farming terms. Things stayed this way for nearly ten more years and really only began to change once the start date for grazing was put back from 1st June to 1st July each year, a change that allowed the hay rattle, which was then confined to one small section of the site, more time in which to flower and set seed before being exposed to any grazing impact. 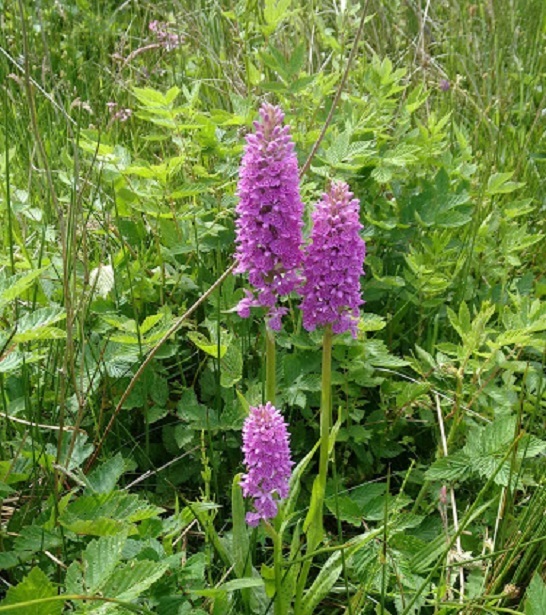 The response was almost immediate and within a year or two the rattle had begun to advance across the site with new plants seen flowering several hundred metres from their original location. The movement of animals around the site must have been helping the seed to spread, clinging to damp and muddy hooves so that, gradually, over a period of 10 years it has now extended its range across the whole 30 acres. This paved the way for the orchids, knapweed, ox-eye daisy and the rest to begin their own take over of the site, taking advantage of the grasses’ reduced vigour, following the parasitic impact of the hay rattle. Hopefully this process will continue to allow new flower species to find their way into the Gait Barrows pastures, creating an ever-more attractive mix of species, all the more special because it has been ordained by Mother Nature herself, ably assisted by some very willing cows. Gait Barrows demonstrates that grazing alone can be a surprisingly effective means for managing and restoring meadows, provided that the stocking levels and timing can be appropriately set. This does away with the costly machinery and the manpower needed to get a hay crop and all the angst of having to wait for that vital spell of fine weather in which to safely gather home the harvest. The key here is being able to delay the start of grazing until the flowering season is well under way, by which time the nutritional value of the grazing will have begun to decline, making this a less attractive option for farmers wishing to maximise growth rates of their livestock. MBCGC only uses breeds of livestock native to Britain because they are noted for their ability to thrive on unimproved pastures and rough grazing compared with breeds from continental Europe, which usually require a more intensive diet, usually based around ‘improved’ grasslands, made lush from the use of artificial fertilizers. For most meadow restoration projects, the biggest problem to be overcome is the excess of soil nutrients left over from past use of these fertilizers. This normally takes several years of removing the hay crop whilst not applying fertilizers or manure, a process that eventually reduces soil fertility to levels that allow wild flowers to establish and compete with the more competitive grasses. This worked well enough in the initial years of restoration at Gait Barrows; so well in fact that mowing was eventually abandoned when the yield had diminished to the point where hay-time was no longer viable. It’s very unlikely that, without this fertility-reduction phase, these meadows would ever have achieved their current levels of species richness. Having viewed the grazed meadows of Gait Barrows, the group returned to Leighton Moss for refreshments. 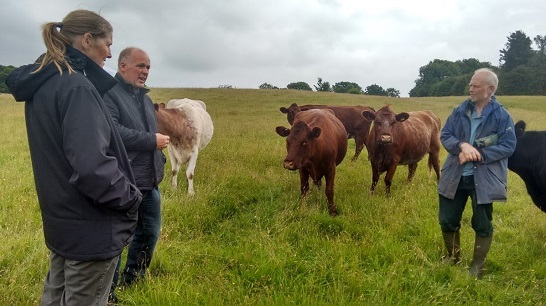 This was followed by further discussions, led by Ruth, who provided a useful overview of the options for and issues arising from the use of grazing animals in meadow restoration. The day concluded with a question and answer session during which a number of points arising from the day were raised and technical queries were dealt with.